In 1982 the Sir Galahad was destroyed in Bluff Cove on the Falkland Islands. 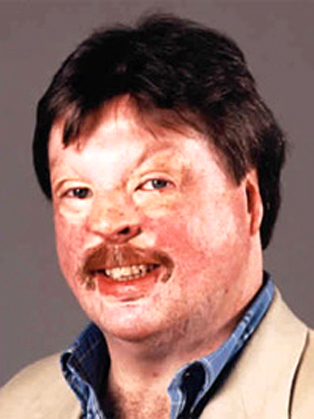 On board was Simon Weston, Welsh Guardsman, a name and face that was going to become well known for his struggle to overcome his injuries (46% burns) and redefine his role in life. Simon endured years of re-constructive surgery, including 70 major operations or surgical procedures. Today Simon takes the opportunity to convey his story in order to motivate and encourage those, who like him, want to move on to the next goal, whatever it may be! The only obstacles to achieving one's targets and successes are those you create for yourself. His words never fail to inspire you. Following his injuries, Simon's road to physical, spiritual and mental recovery saw him active in a number of highly successful ventures. He remains a tireless worker for the charity and his charitable work earned him an OBE in the 1992 Queen's Birthday Honours. He was also awarded Freedom of the City of Liverpool in 2002 in recognition of his bravery and his charity work in the region. He has appeared in the Top 100 Merseysiders list in 2003 and honoured as one of the top 100 Welsh Heroes in 2004. Simon's story has been well publicised and he has been the subject of five major BBC Television documentaries: Simon's War, Simon's Peace, Simon's Triumph, Simon's Return and in April 1999, Simon's Journey. He has been a 'victim' on This is Your Life. His autobiography, Walking Tall, was No1 in the best selling list. Going Back was also a best seller being in the top 10 for eight weeks. He then wrote a series of fiction books with titles such as Cause of Death and Phoenix. His most recent book, Moving On was published in 2003 and sees Simon lay his Falklands ghosts to rest. Simon has also published 4 childrens books - Get Fit With Nelson is released in 2013. In 2007 Simon presented a series of programmes for ITN, looking back at the 25th Anniversary of the Falklands War, and in 2008 again worked with ITN covering the 90th Anniversary of the end of the First World War. In 2012 he went back to the Falklands with war reporter Mike Nicholson and former marine Nick Taylor in a moving programme called Returning to the Falklands. In 'Simon's Heroes', he was able to utilise skills he developed both as a radio presenter in the early 1990s and now as a business speaker, to talk to people touched by the Falklands conflict. His voice-over for the documentary clearly demonstrates Simon's talent for communication. In 2013 Simon was voted by viewers of the BBC One Show to have his Portrait hung in the National Portrait Gallery, and in 2014 topped a poll conducted by Freuds on the Nations Favourite Hero. Simon's message is one of single-minded determination, to not only accept what is, but to turn that to your advantage. Simon's own career clearly demonstrates how a positive mental attitude can achieve great business goals.